Since those of us living in the northern hemisphere are in the full swing of summer at the moment, you might want to consider bringing your kids out to the great outdoors for some camping fun instead of being stuck at home, repeating the same old cycle of you asking them to get out and bask in the sun instead of remaining cooped up at home all day long in front of the video game console. Take the more proactive approach, and as part of your persuasive efforts, then the £54.99 Kids VW Camper Van Tent might just be able to do the trick. It will be a whole lot more hygienic and comfortable sleeping in this instead of in an old, beat up Volkswagen, don’t you think so? Even better is, the Kids VW Camper Van Tent is considered to be an officially licensed product by Volkswagen that is modelled after the iconic T1 Camper Van. It is good enough for sleep or play, as it houses up to three of your progeny at any one time. 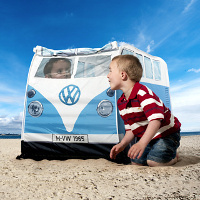 You can use this indoors, outdoors, or even by the beach, the Kids VW Camper Van Tent will hold up since it is waterproof and boasts of UV protection. Each tent measures slightly more than a meter and a half long, so adults can snuggle up inside too if they want.